Last year I wrote a recap of the Arnold Classic (2018) and begged the question of if we could have asked any more from the Arnold. I thought 2018 was one of the better Arnold Classic’s to date and while this year had some duds in the show, I still think the show overall is getting better with each passing year – similar to the physique of Brandon Curry. There were some winners this year and some horrendous losers as well. Some dudes came ready to play while others looked like they needed another month to get ready. Below are some of the winners and losers (in my opinion) from the 2019 Arnold Classic Men’s Open. By far, Brandon Curry shut the city of Columbus down when he graced the stage. I’m not sure there is a single bodybuilder out there today who sacrificed as much as Brandon Curry has over the last few years. Leaving his family here in the states to make the trek to Kuwait, while a necessary evil, can’t be an easy thing to do – especially when you have kids. But Brandon Curry has accomplished something that I can’t say we have seen lately in men’s open and that’s a complete transformation year over year. If Brandon Curry was a business, he’d be showing consistent triple-digit growth YOY. He most definitely is investing more than anyone in his “business” to get it done on the bodybuilding stage. Legs have been a part of Brandon that has been criticized the most and seemed to be lagging compared to the rest of his body. Could he add a little more to his upper body such as his arms, shoulders, and back mass? Sure, but he better be putting in the work to keep his legs in line with his upper body as well. I can honestly say though, that Brandon has put together a complete package. He’s got a tight waist, added some width to an already good back, and his wheels can now hang with most of the guys up on stage. The question will become, what will he look like on the Olympia stage next to guys like Ramy and Rhoden? With Phil out this year, it opens the door for guys like Curry to take home the Sandow. It’s hard to ever count out William Bonac and even though he took second place, he’s always a contender to win any show he enters. Every time I see him walk on a stage it’s like I’m looking at a smaller version of Kai Greene. Remember him? What a shame he bailed on the industry from a competition standpoint. Anywho… Bonac is one extremely consistent bodybuilder. He comes into each show looking the same – which isn’t a bad thing when you have his physique. 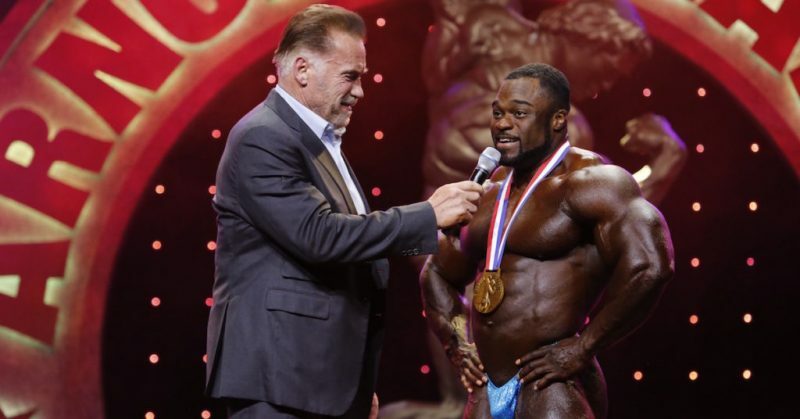 Could Bonac have won the Arnold Classic? I think so but it’s also my opinion that Curry brought the most complete package that weekend. Does taking second hurt Bonac’s chances of winning the Olympia or losing any type of momentum? I don’t believe so. Bonac is a threat any day of the week and can easily come into Olympia weekend and steal the show. I remember a couple of years ago, Geoff Roberts and I were talking about Luke Sandoe on Central Bodybuilding Radio. We mentioned how he could be an up and coming star if he put the puzzle pieces together but up until that point he hadn’t. Well, here he is folks. While I’m a fan of Brandon Curry, Luke completely blew me away and was 100% deserving of his third-place finish. Luke added some mass to his physique and while he was holding a little water, clearly beat out the rest of the line-up easily with what he brought to the stage. From the front, he looked great. From the back, he looked great. If you’re not paying attention to Luke, I HIGHLY recommend you start following him as he could very well be one of the guys to make the top 5 at the Olympia. Where do I even start? Ok… first off, I’m a huge fan of Cedric. I think he’s hilarious and what the industry needs. He has a great physique, however, he doesn’t always bring the best conditioning to the stage. He’s inconsistent. When he won the Arnold back in 2017, I thought this was going to be the rise of Cedric. He’d start placing better at the Olympia, he would be on a winning streak, and life would be good for him. Well, it didn’t pan out that way. Why? Because his physique continues to be hit or miss. I’ll probably get some hate for this but I feel Cedric’s fourth-place finish was a charity placing. He looked absolutely horrible during pre-judging and I honestly thought based off of that he would be outside of the top 6. He tightened things up for the night show but even then, I didn’t think he was worthy of a fourth-place finish. I think Cedric needs to get back with Chris Aceto and let Chris do his thing again. Three letters are all that are needed… WTF. We saw a video online of Roelly a few weeks out from the Arnold guest posing and at that point, it was safe to say he needed a miracle to get it together in time for the Arnold. Before the show, Roelly said he wanted to let his physique do the talking and he didn’t mind all the sh*t-talking online. Well, his physique didn’t say much at all, in my opinion. Roelly looked like he did back in 2017 and prior where we never knew what conditioning he would come in with. Don’t get me wrong, Roelly is a threat even at 90% but when you have guys who are peaking like Brandon Curry in the line-up, you can’t be off at all or you’re opening the floodgates. And Roelly opened them all the way up. Following the show, Roelly mentioned he had knee surgery which didn’t allow him to train properly for the Arnold. While I can respect his dedication to get on stage following surgery, I feel his conditioning could have still been better and he could have dialed it in even without training his legs hard. It looked like he started his prep (diet) late which is why he didn’t look as tight. I think Roelly will hit his mark at the upcoming Arnold Australia and could potentially take home the win if he can nail his conditioning. That being said, Roelly needs to figure things out. He’s extremely inconsistent and if he can’t start connecting the dots, who knows what he will look like in Vegas. Steve Kuclo is probably one of the nicest guys you’ll meet in the IFBB. He’s down to earth and seems to be liked by everyone. That is until he gets on stage and starts posing. While Steve placed sixth this year, his physique continues to improve. He’s a big man and when he nails his conditioning, he can knock off any of the top competitors who aren’t 100%. You can’t knock Steve for mass. He’s a big dude. If he can get a little more definition, I think he would be a bigger threat. Do I feel he’ll be gracing the top 6 at the Olympia? Probably not. But any other show he decides to jump on stage at this year could be one that he takes home the win. I’m a fan of Victor Martinez and from the photos I saw online prior to the Arnold, I really thought he could place top 5. But it wasn’t meant to be and he landed in tenth. His legs have gotten considerably smaller while his upper body is still that classic Victor look. He didn’t come in as hard as he normally looks even though he, himself, said he toned down the size a little bit. I was lucky enough to have interviewed Victor prior to the 2007 Arnold Classic and to this day I still see that physique as one that could win the Arnold every year. I’m not sure how much longer Victor will grace the stage but he’s definitely left a mark on the sport of bodybuilding. Previous Previous post: Is Personal Training the Ticket for Top Bodybuilders?